We Invite Your Shelter or Adoption Organization to Participate! 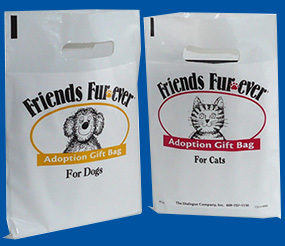 Friends Fur-ever Gift Bags are available free of charge for hand-out to adopters, to help new pet parents think about pet care and the responsibilities of pet ownership. The bags serve as a nice welcome gift from you to adopting families. The program has been operating since 1991 and has received an overwhelming response from the 2,000 shelters, humane societies, and other adoption organizations that currently participate nationwide. We invite you to enroll by completing our online application form! We're able to offer you the program completely free of charge (we even pay for shipping) because it’s funded by a select group of company sponsors who include their samples and materials in the gift bags. 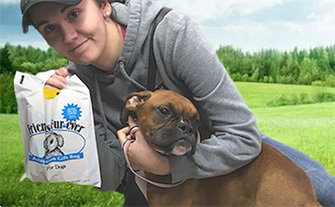 The program allows new pet parents the opportunity to try pet care products and save money with coupons on pet care items. You will never receive a bill or any charge for participating, and you may cancel the program at any time without cost or obligation. The materials in the gift bags are not to be used for the care or feeding of animals you are housing prior to their adoption. Distribute only one gift bag per adoption. Agree that you will not sell Friends Fur-ever gift bags, or any contents thereof, or distribute in any other manner. Simply complete & submit the application form. Only shelters, humane societies, and other adoption organizations based in the continental U.S. are eligible. It is very important to give us accurate adoption numbers for your puppies/dogs and kittens/cats, because your shipments are based on these numbers. Gift bags will be shipped to you via Fedex Ground, completely prepacked. You'll receive 1 to 3 shipments each year, depending on your adoption numbers. We pay all shipping charges, so there is no cost to you of any kind. You will receive a request form to update your adoption numbers once each year, which you must return to us in order to remain eligible to receive free gift bags. Otherwise, the shipments are automatic, and always without charge! Copyright © 2001-2018 by The Dialogue Company. All rights strictly reserved.